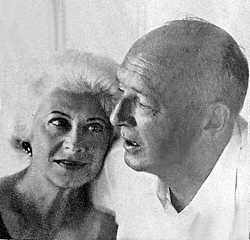 The Atlantic article, ‘The Legend of Vera Nabokov: Why Writers Pine for a Do-It-All Spouse‘ caused me to consider how we all need a Vera, and how we sometimes are Vera Nabokov. If you don’t have a do-it-all partner in your life, read on to find our how to create a modern day version of Vera. When we had our first child, I was lucky enough to switch to contract work from home. Working from home for me meant hiring an assistant / nanny. As I was new to parenthood, I welcomed the support as I did not have any family nearby. Having help with the children meant that I could be productive for our household, our company, and still bring in a modest income. The best part of having help was that I was able to more comfortably transition into my new role as mother. Being shot through a cannon into parenthood is startling and can be stressful. Even on my most unproductive days, my spouse decided that having an assistant or nanny was worth the expense even if it impacted our savings. We are fortunate that we could afford to have help for sure. Not having family nearby, I was relieved to have help. I relished the time to recalibrate, recharge and find inspiration. Getting help was expensive, but we figured therapy and drugs would also not be cheap, so we got an assistant – our very own Vera Nabokov. As the kids grew older, it became harder to do creative work from home around increasingly energetic children. I decided to stop contracting and work full-time to support my husband in his work and support the kids in their work – playing and learning. I became Vera to my family. In my Vera role, I was secretary, editor, recruiter, manager, art department, accountant, cook, teacher, counselor and wife. Homeschooling our children meant classes, playdates and schedules to coordinate. Thankfully my partner managed our investments, technical needs, the coffee making and the dishwasher. For nearly three years, I managed our lives because the rest of the family was not in a place to contribute much. Making space for the family to relax and play when we were together was critical to our families health and survival. After three years of muscling through some tough times, it was clear that Vera needed to go. The burn out we experienced in my years of being the do-it-all spouse led to an important and life changing simplification of our lives. My partner took a job that was better for his and our families health. The kids were older and less overwhelmed after we reduced our footprint, and both circumstances made them better contributors. Once unburdened from unnecessary tasks and things, we all more had time to help each other and take care of ourselves. Minimalism took away the need for a do-it-all spouse. I can still ‘Vera’ the heck out of a day but I now know when to stop. Our family is happier when everyone gives and everyone receives. Constant giving is not sustainable and leads to burn out and feelings of neglect and resentment. Carving out time for the givers is critical their happiness. It’s not enough to see everyone thrive and grow around us, givers also need to opportunities to thrive and grow or they will become miserable. To recharge during my Vera years, I took ice skating lessons, math and science classes, taught jujitsu, practiced parkour 2-3 times a week, and even participated in a parkour competition. I also started writing again. The act of writing allows me to search my mind and the world for the beautiful and hopeful things. Introspection is therapeutic. Virtualizing and dramatically downsizing meant that we no longer had the daily chores that come with home ownership and having a family. Family members could now contribute in ways they enjoyed rather than those ways dictated by a overly full house. We no longer needed a Vera Nabokov in our life and if we found that we did, we would know we were doing something wrong. When we find ourselves overwhelmed, taxed or too busy we turn to technology to meet our needs – Robo Vera! When the tech stops meeting our needs, we get different tech. So, downsize, make smart purchases, save more, consume less and use technology to your every advantage. By living simply and effectively, we will be able to enjoy the modern day equivalent of Vera.